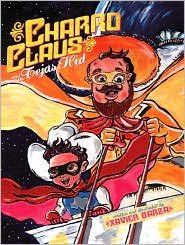 Perhaps the earliest photo of me and Santa Claus. I have good news and bad news this Christmas. The bad news is I had one Christmas delivery problem. Considering the long line I waited in at the post office in New Orleans, I should have insured every single package. Of course, the one that I did not ensure, a beautiful little dress with birds on it for my goddaughter, was the one package that was ransacked and ripped open, never to make its way to Audrey Rose in time for Christmas. The U.S. post office turned me into Nina Scrooge. This was probably why there was no cute photo blasted on social media or a social phone call to thank me for the gift. I hope that whoever has the cute little dress is twirling and happy. I've been lucky in years past, all the mailing of presents and cards I've done have never met such a terrible fate. It's possible that this incident is simply the first time the post office has confessed to the ill fate of the package and that well meaning relatives simply thought I hadn't bothered sending anything. I did consider sending a lump of coal to my father's namesake, but thought better of it as my brother does not deserve the Christmas slight, even though I haven't heard from him all year. The okay news is that my goddaughter is only two years old, too young to care about gifts and not yet able to make out a long list for Santa Claus. A lump coal. Perhaps you know someone who received one, or should have? Speaking of Santa Claus, he gifted me with a fabulous present, Thank You, Santa Baby! Like Eartha Kitt's 1953 song says, Been an Angel All Year. I may have been naughty in years past, but 2016 for all its election and grim reaper horrors, finally did one thing right, grant me a good Christmas present. When my mother passed away, my grandmother was so heart broken she stopped celebrating Christmas and going to the movies, two things she enjoyed sharing with my mother. Most holidays were never the same. I saw all of my mother's brothers again this year when my grandmother passed away in March. I'm sure some gifts were exchanged back when my mother passed away, but it seems as if the whole family had done away with the practice. 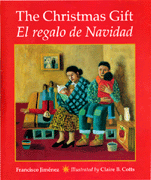 Doing away with exchanging gifts was liberating because it was much easier not to expect anything. In some ways, I had also sworn off Christmas and the whole gift idea. However, I always secretly harbored a wish and sometimes even asked Santa Claus for the gift. The wish was to travel to a far away place with warm blue beaches for swimming. A photo of me and Santa Claus, taken in New Orleans earlier this year. So what did Santa Claus bring the mermaid of California in New Orleans? Why mermaid gear: a mermaid ceramic coffee cup, a mermaid charm, duck boots, and a trip to Tahiti! I am not a gambler, but I somehow hit the Christmas jackpot. I have been asking Santa Baby for a trip to a faraway place for a long, long time. After so many years of harboring the same wish, I came to believe that everything I ever wanted was right under my nose. After all, Santa Barbara is known as paradise. To some it may be a far away place nestled between the mountains and the ocean, the perfect destination vacation. The fact that that the ocean is too cold to swim in most of the year means one should appreciate the few months that a dip in the Pacific is refreshing. Santa Barbara is not too far from the South Los Angeles town I grew up in and Christmas beggars can't be choosy. Imagine my grand surprise when I found a plane ticket to Tahiti left in my stocking! I leave in March. More mermaid adventures are in my future. Sporting my mermaid yoga pants at Arroyo Burro Beach in Santa Barbara last November. Posted by Rene Colato Lainez at 12:02 AM 0 comments. Click here to leave a comment. 2016 was the year we had. For some, the best of years, for others, the worst of years. Overall, politically, a foul year. Culturally, minutes meld into hours into days into weeks into months, into seasons, and when you look back, a whole year has passed. All in all, even if I could, 2016 was a year I wouldn't give back. 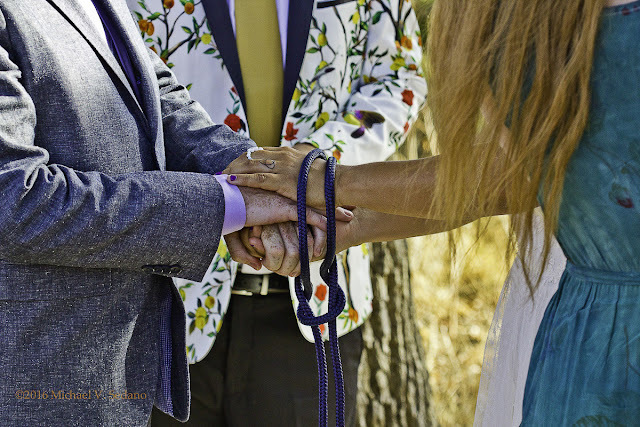 When a person reaches his seventy-first year, as I dd in 2016, events and experiences have repeated themselves over time, accumulating to form the rituals and holidays that give shape to cultura and familia. 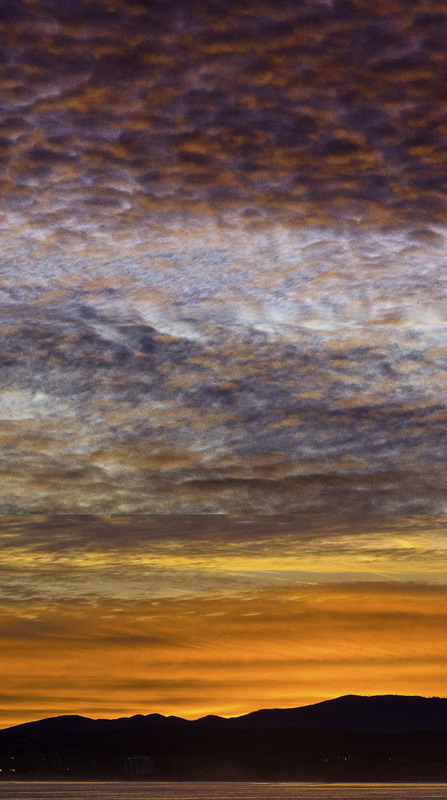 Here in fotos are some decisive photographic moments I set out to capture, or just happened. The camera captures a tiny slice of time when the right pose freezes, when chaos settles into an ideal composition, when a plan comes together, when a path reveals something breath-taking. It's in moments like these when one comes fully alive. Ritual. My wife and I have celebrated the New Year with a rich breakfast of Eggs Benedict. Timing is everything. 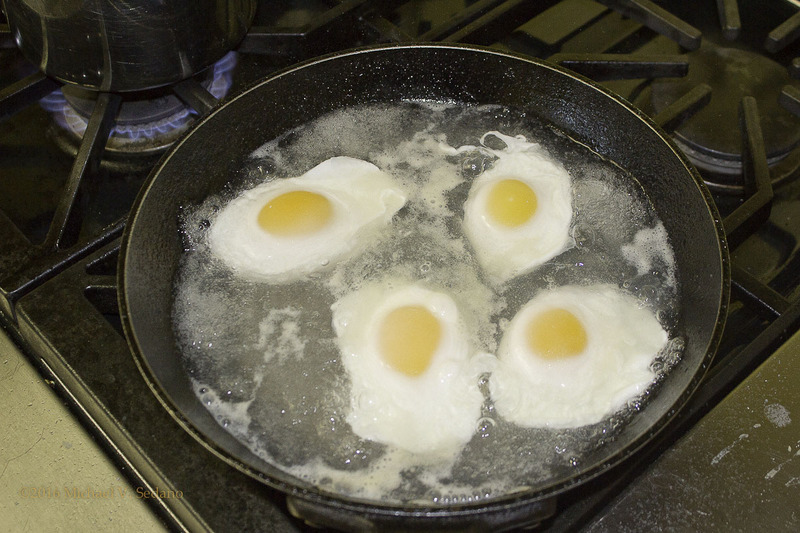 The muffins and ham first, a moment later the poached eggs, quickly whip egg yolks into hot lemony butter. A glass of champagne and let us begin the new year. Holidays are tamalada time. 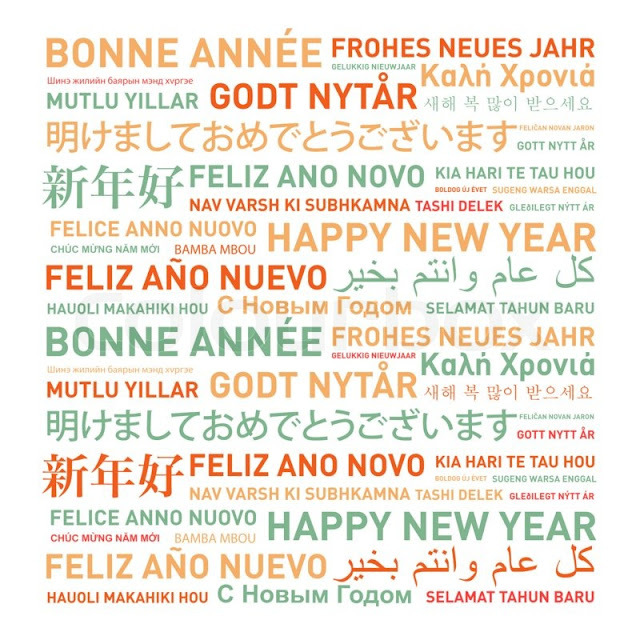 In recent years our tamalada has migrated from before Christmas to the New Year, the eve of which is a perfect time for familia, friends, laughter, celebration, and tamales. The greatest joy is teaching small hands to make tamales, to see the joyful smiles as a kid holds up her first tamal. 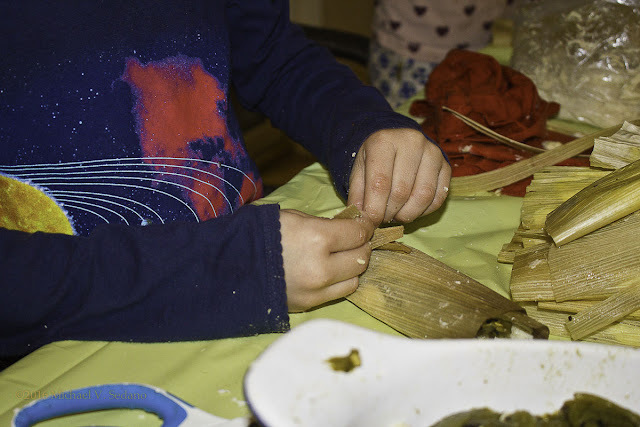 Of special happiness was my nine year-old granddaughter offering suggestions and instructions to her friends, some of whom had never eaten a real tamal. February brought the Poet Laureate of the United States to Cal State LA. 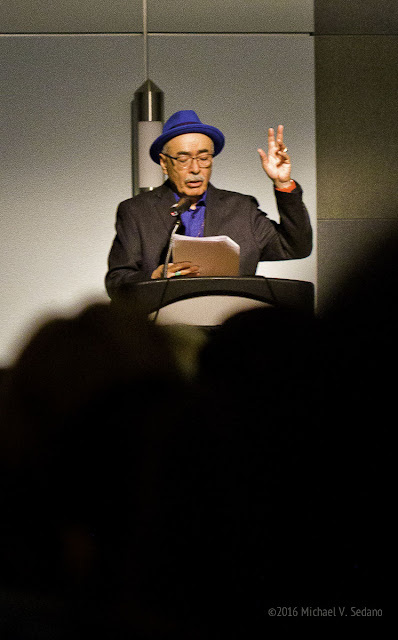 Juan Felipe Herrera drew a standing room only crowd. I arrived early, but so late I could garner a seat way in the rear and didn't get a chance to saludar Juan Felipe. February was a road-trip month for us, up North to Monterrey and the Big Sur coastline. I've been making the drive from Southern California to the Monterrey area since the1950s, first with my mom and dad, then a honeymoon, followed soon thereafter by a ride up to Ft. Ord with a busload of draftees. Rain, desperately needed rain greened the landscape but did little to fill the San Luis Reservoir at the mouth of Pacheco Pass. 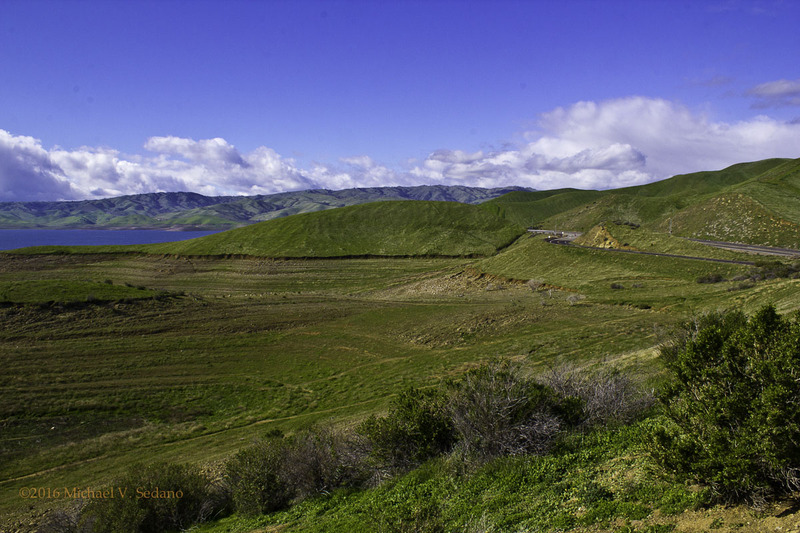 One of California's most beautiful landscapes, Pacheco Pass carries travelers from the great Central Valley to the coastal Salinas valley. Spectacular vistas of golden poppies will cover the hillsides, but not this trip. Instead, the depleted reservoir gives one heartache to see how the water has receded far from the highway. Lapping bays once tempted visitors to cast a line and fish only a few yards from the road. Ordinarily any trip I make to Monterrey requires a sentimental journey through the grounds of Ft. Ord, now the site of Cal State University Monterrey Bay. I suppose I'm finally past that, as the only view I had in 2016 of Ft. Ord was from the roof of my Cannery Row hotel. 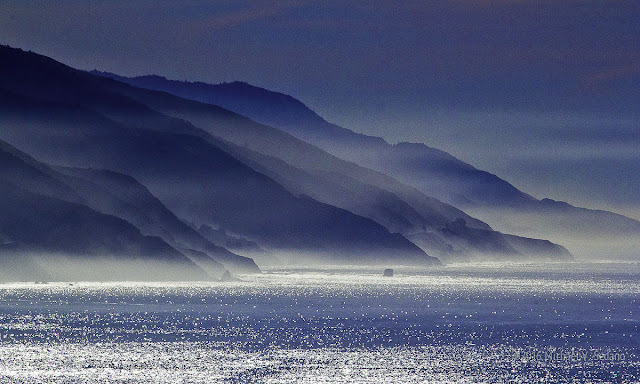 Big Sur will never disappoint eyes hungry for the majestic beauty of unspoiled nature along Highway 1. Relatively unspoiled, that is. The highway department incessantly repairs the roadway turning the drive south into a morning's sojourn instead of an all-day journey. Increasing commercial and residential development on the route between Point Lobos and Cambria makes imperative more frequent visits to the region. 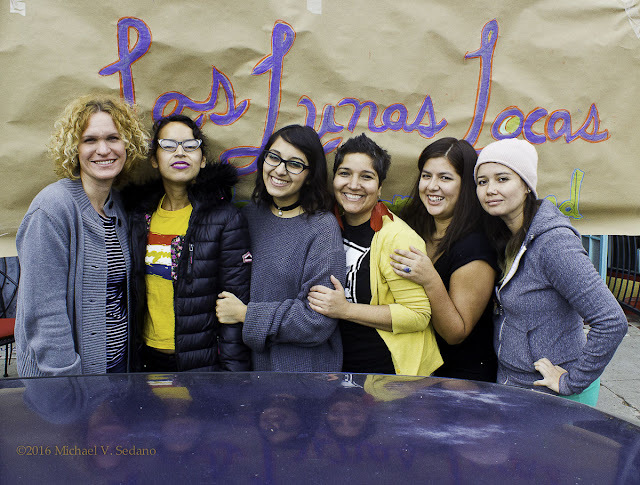 March was road trip month for Las Lunas Locas, a community of women writers who took their show on the road to Sacramento and Fresno and points between. The fundraiser featured the poets typing on-the-spot poems on manual typewriters, faded ribbons and X'd strikeouts. 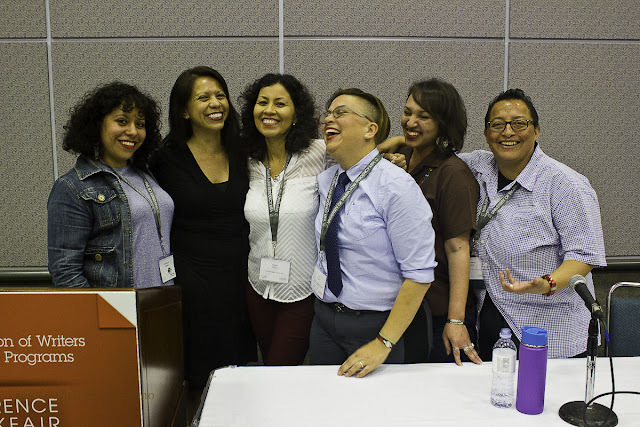 AWP came to Los Angeles in April for a fabulous celebration of writers reading their own stuff to enthusiastic audiences. 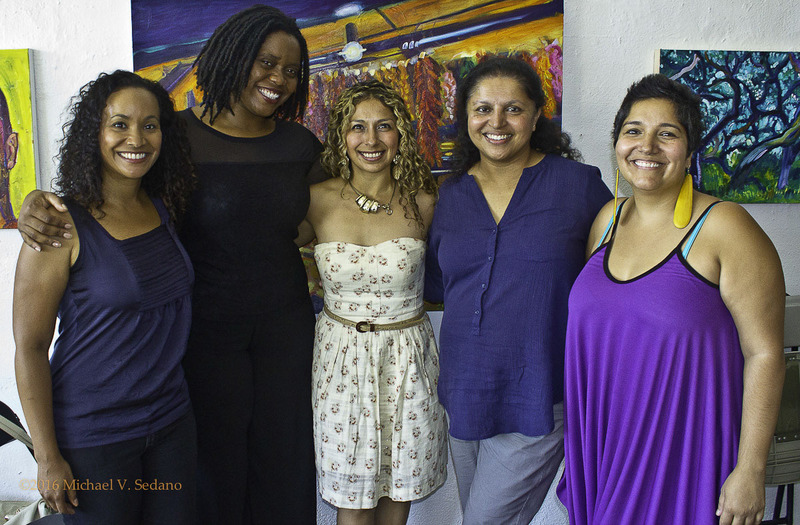 Here the vivacious group of Firme Tejana-Califas writers are flying high after a stunningly effective reading. Clearly, the writers were totally into the sharing. May took us to the Anza-Borrego Desert where rain and Spring had brought profusions of blossoms. But like we were too early for the poppies in Pacheco Pass, we were too late from the peak blooming season. 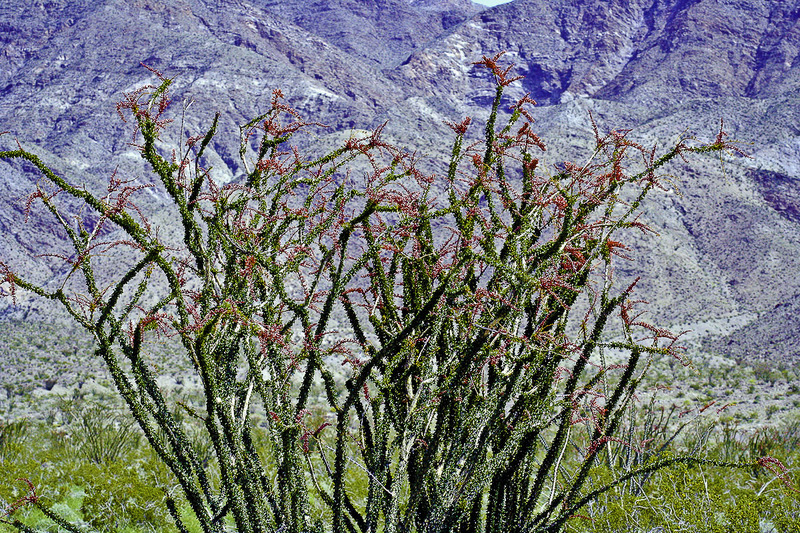 The Ocotillo offered this trip's most spectacular bloomers. 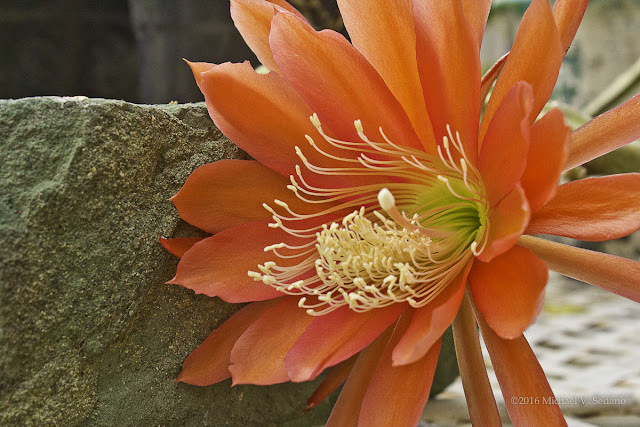 June, and May, mark the height of the Epiphyllum and Echinopsis cactus blooming season. 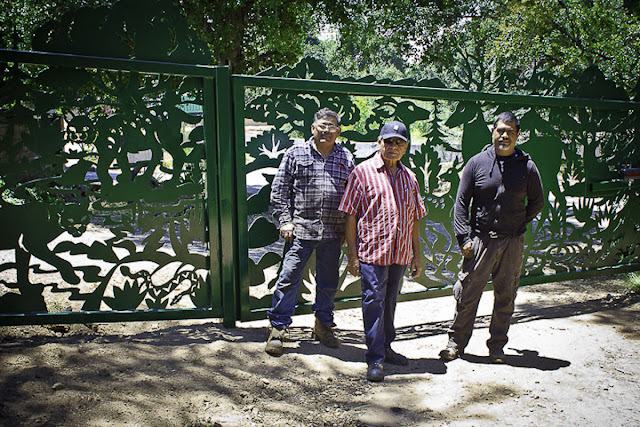 This year we marked June with Michael Amescua and his Earth Iron artisans plasma cutting and installing these steel gates at McDonald's Urban Farm in Altadena. 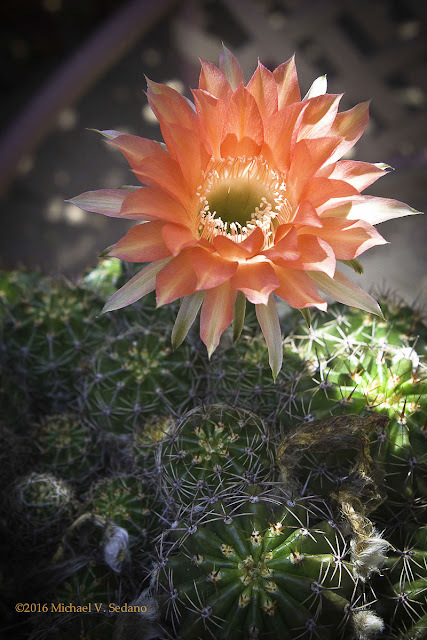 Echinopsis blossoms grow from spiny miniature barrel cactus bodies. I doubt anyone can own a single specimen because the colors of these clumping cacti fill one's eyes with joy. Even better, most plants issue multiple buds that open in the morning and remain spread out all day, then bloom again the next day, and sometimes for a third day. 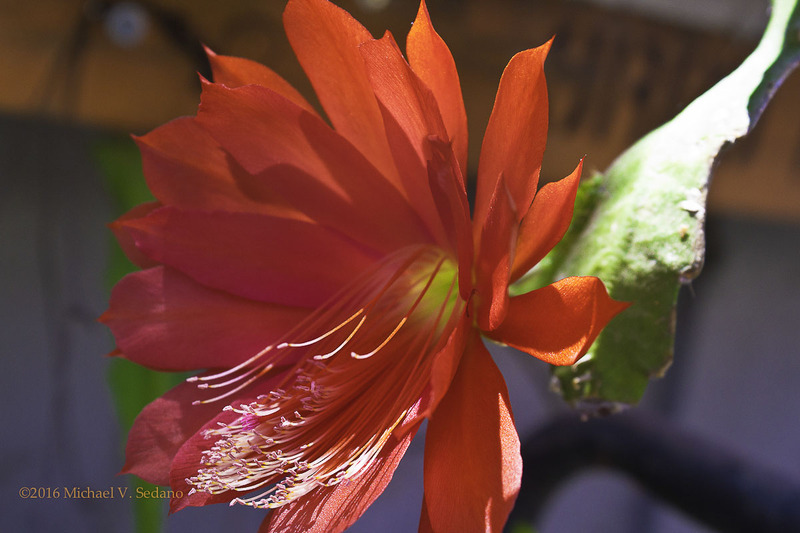 Epiphyllum cacti issue large to giant-size blossoms in rewarding colors and shapes. Popular with hybridizers, collectors can feast their eyes on solid colors, variegated riots, and striped colors. Most bloom early in the morning, some only at night. A few emit a haunting perfume. Sadly, the blooms are ephemeral, fading with the light and heat of mid-day, lasting only one day. July marks the high point of gardening, readings, and arts events in Los Angeles. The height of summer was broiling hot, but today in the cold of late December, the discomfort is only a hazy memory. The events of summer's peak pique memories that make one look forward to next summer. 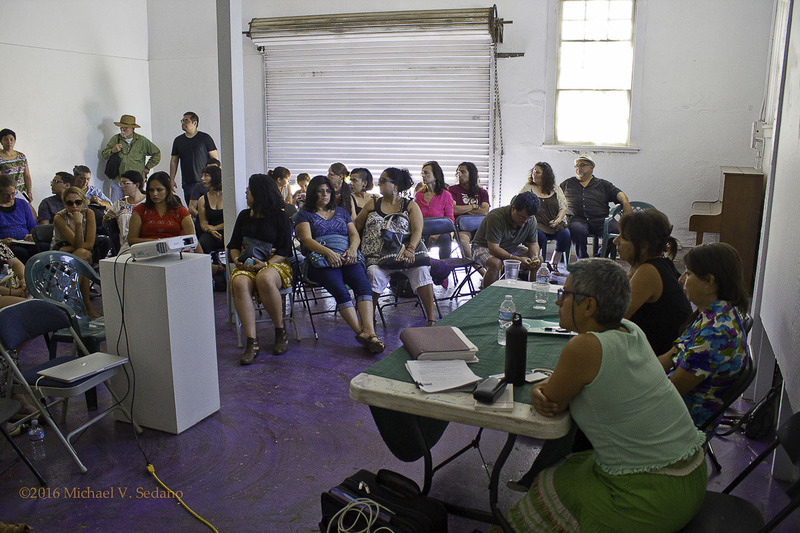 Early July, an SRO audience greets the panelists in a session titled, Troubling Chicana Chicano Art, that featured artists discussing Karen Mary Davalos' treatise Chicana/o Art Since the Sixties: From Errata to Remix, at Avenue 50 Studio. July will forever mark a special month for Los Angeles arts organizer Jessica Ceballos, long-time host of The Bluebird Reading Series, who married Ted Campbell in a sylvan setting north of Los Angeles. July also marks the inception of a long-delayed road trip to Albuquerque to visit with Rudolfo Anaya. Jesus Treviño and I planned the trip for early Spring, but I was detoured by a hospital stay and it wasn't until July that we were able to fulfill our promise to Don Rudy to pay him a visit. The road-trippers were having a great platica, to the point we missed the Barstow turn-off and happened upon a science-fiction landscape of alien towers in the middle of Nowhere, Califas. 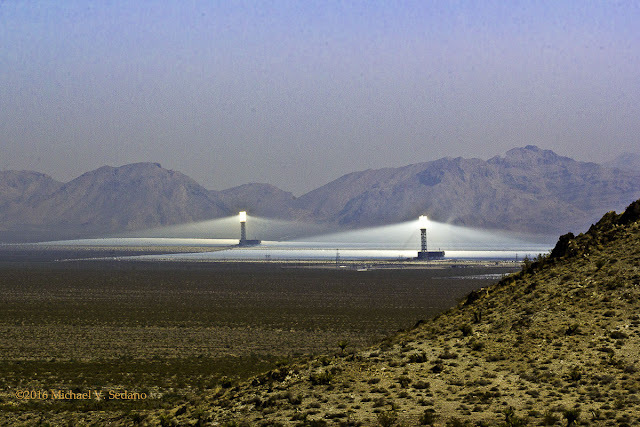 It is the Ivanpah Solar Power Facility at the western terminus of the road to Searchlight, NV. 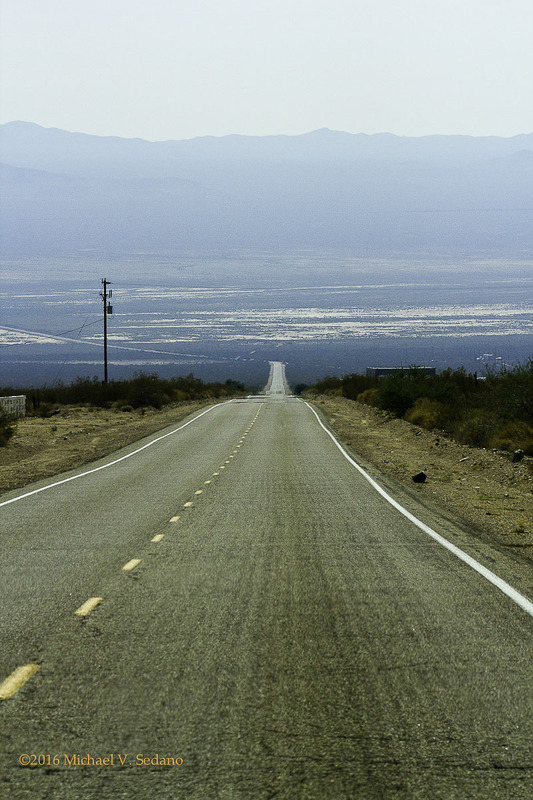 A road less traveled. From Ivanpah to Searchlight, then onto the main highway and the road to Winslow AZ, thereafter to Alburquerque. This is a fabulous desert and one I shall visit again, perhaps in 2017. 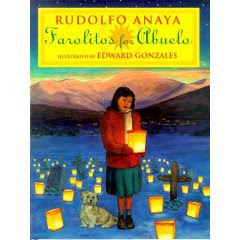 Rudolfo Anaya is a wonderful host. After sitting with us for hours talking principally about his most recent works, Poems from the Rio Grande, Randy Lopez Goes Home, The Old Man's Love Story, and The Sorrows of Young Alfonso, he served us a delicious lunch of gluten-free enchiladas and savory arroz. We finished our visit with a traguito of good tequila and a toast. ¡Hasta la proxima! Still flying high from the four days on the road with Jesus, I sat in on a Hollywood Bowl rehearsal of the LA Philharmonic. 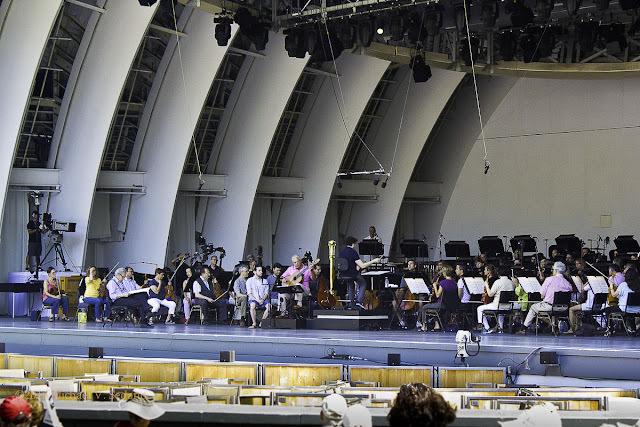 The band, Gustavo Dudamel, and Pepe Romero played through key measures then were joined by Lalo Schifrin, who had composed the piece Romero would play that week. 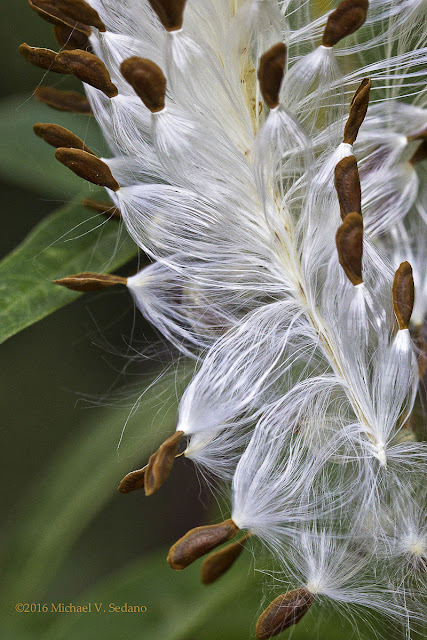 A quiet day in the garden introduced me to an unfolding seed pod of the milkweed. This plant attracts Monarch butterflies to the yard. Horticulturalists advise to be careful where you plant the butterfly plant because it can quickly establish itself as a weedy interloper. The profusion of seeds fly off on their fibrous parachutes, the slightest breeze carrying them to a place to sprout. August often brings a second blooming period for Epiphyllums and Echinopsis. 2016 August brought two of those delights with it, the scarlet Epiphyllum, the pure white Echinopsis. 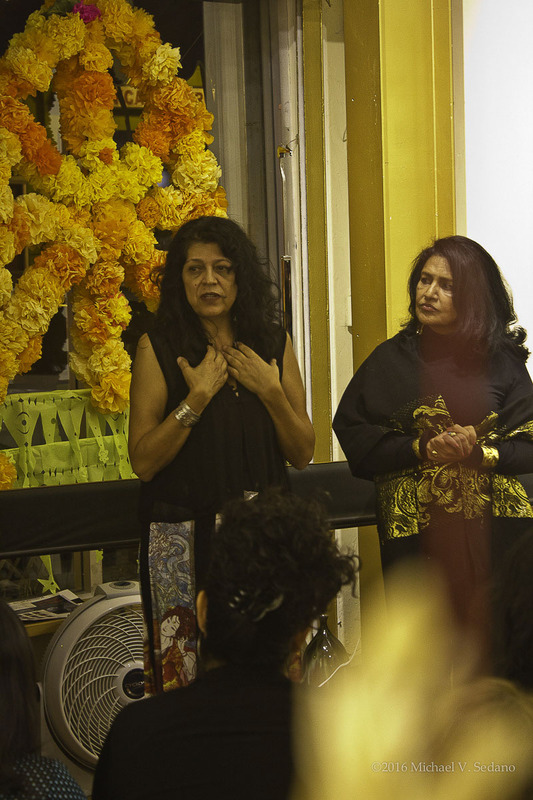 In August, Karineh Mahdessian continued organizing exciting and interesting readings in La Palabra Reading Series sponsored by Avenue 50 Studio. One of the extra pleasures of hearing the artists read is the walls featuring graphic artists like Margaret Garcia. September arrives and with Fall on the horizon, harvest festivals and county fairs come to town. 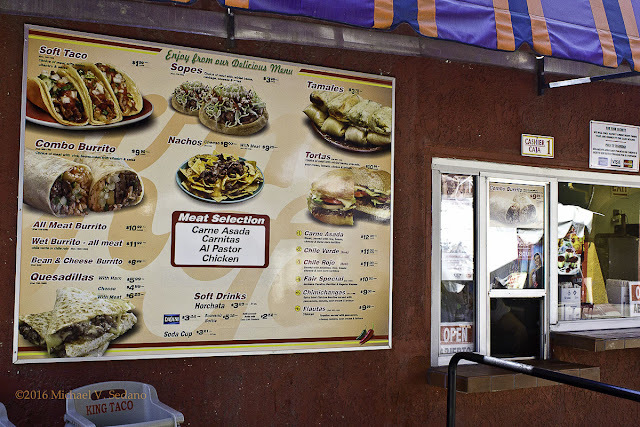 In 2016, the Los Angeles County Fair and King Taco introduced the eleven dollar burrito. $10.99, to be fair. Then there's $8.99 for beans and cheese. 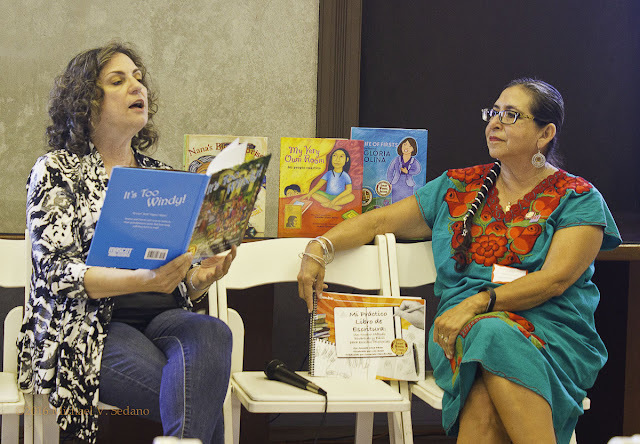 September brought the latest iteration of the Latino Book and Family Festival to Los Angeles. Enthusiastic authors brought their latest publications, and found themselves speaking to nearly-empty rooms. 2016's LBFF was a travesty creating speculation over what 2017 will bring for this once-healthy and heavily-attended raza literary festival. This year's venue, LA Plaza de Cultura y Artes, is a wonderful museum that hosts numerous successful events, like the Macondistas reading during AWP. No visit to DTLA, downtown Los Angeles, is complete without visiting The Pope of Broadway at the corner of Third and Broadway. 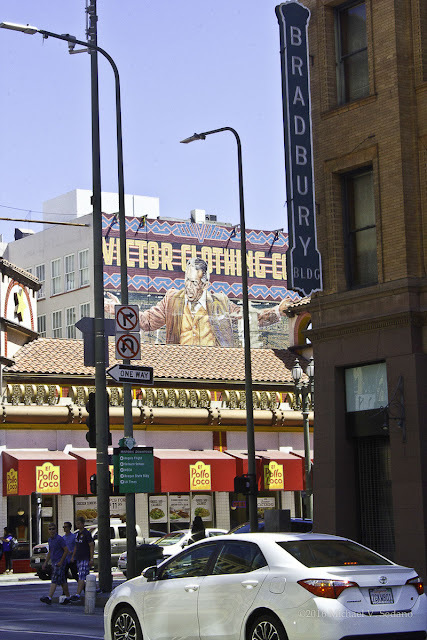 Artist Eloy Torrez is in the final days of restoring his magnificent mural featuring Anthony Quinn. The rapidly gentrifying Grand Central Market is nearby, along with the architectural marvels of the Million Dollar Theatre and the Bradbury Building. 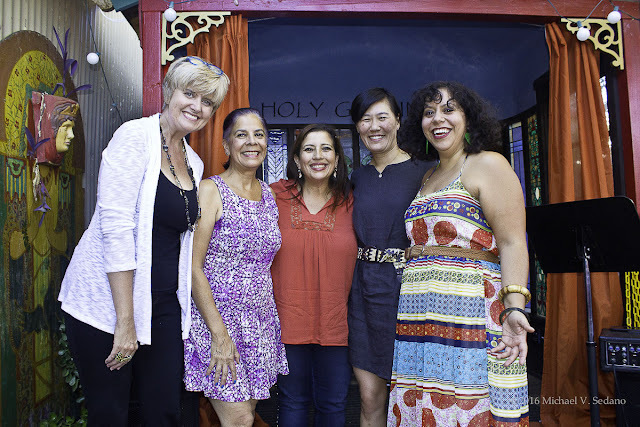 September 2016 wrapped with a beautiful Hitched reading at Holy Grounds coffee shop in El Sereno at the eastern border of Los Angeles. The Hitched series, organized by Xochitl-Julisa Bermejo, recently moved from the far west side of LA to its new venue. Disastrously, some pendejo drove a car into the front door of Holy Grounds one night, forcing Hitched to alternative venues until after February 2017. October at McDonald's Urban Farm sees Cookie and Cow happily living in their birria-free zone behind Michael Amescua's gates. 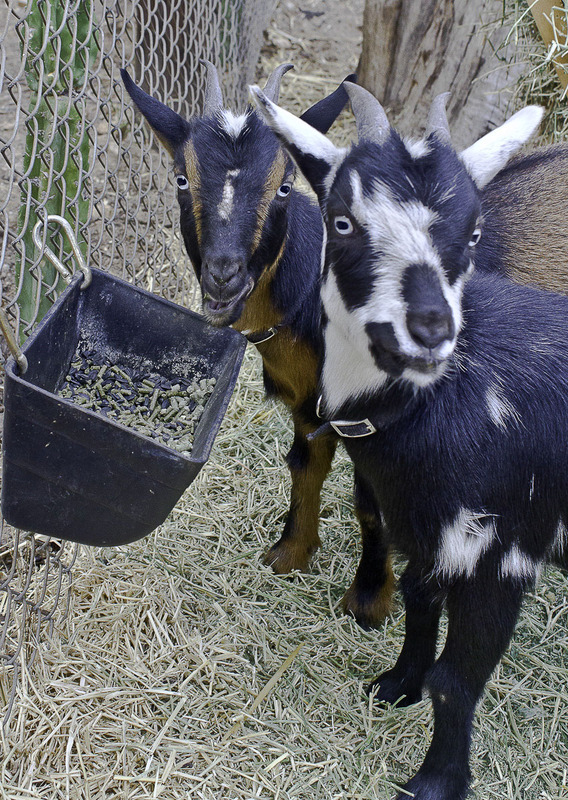 Cookie will be a mother in early 2017, and her milk will then be the basis of fresh cheese and yoghurt for sale at Altadena's Farmers Market. In early October, I attended a fascinating talk on the Mexican mind by Verónica Volkow hosted by UNAM-LA, Universidad Nacional Autónoma de México en Los Angeles. The well-attended event at LA Plaza de Cultura y Artes is part of ongoing educational outreach the Mexican National University conducts here in Los Angeles. 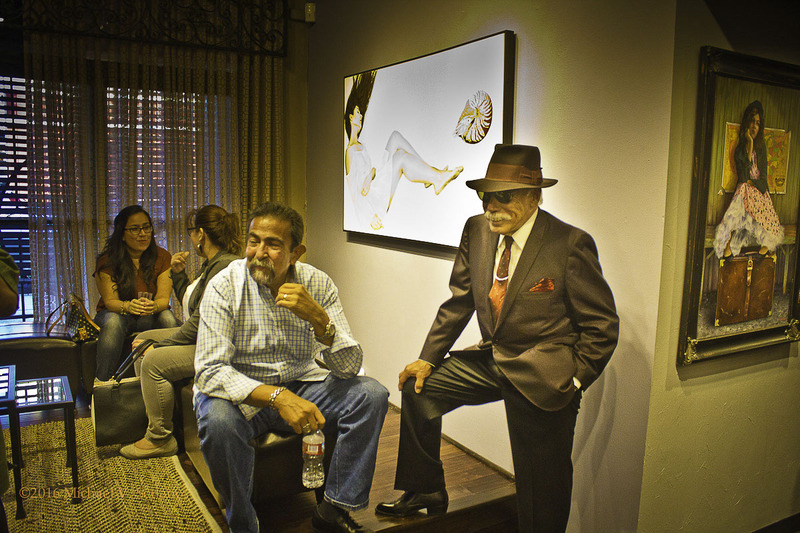 One of October 2016's highlights was the eleventh anniversary exhibition at ChimMaya Gallery in East LA. Dozens of powerful works by artists represented by the gallery drew an engaging crowd of collectors, artists, and bloggers. 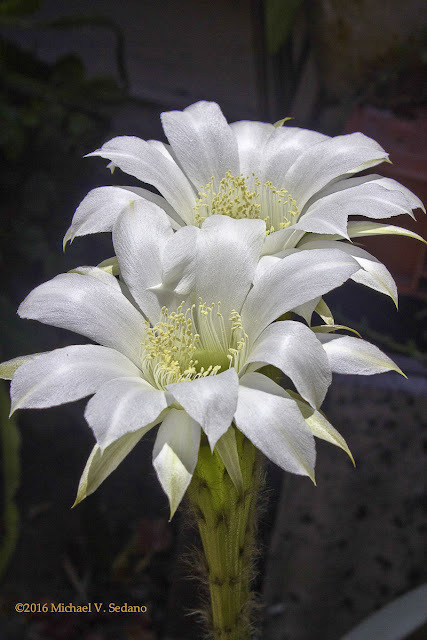 October is an unusual, but not rare, month to see Echinopsis blossoms. 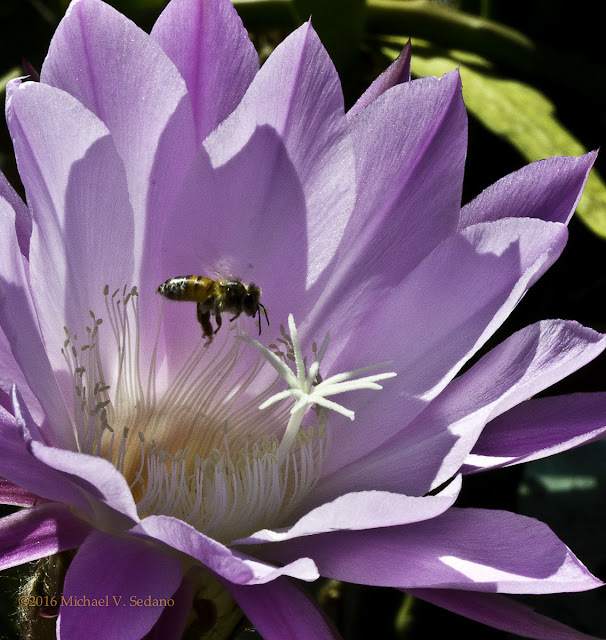 This year my violet Echinopsis waited until October to grace the garden with a blossom that lasted three days, two of them in full spectacle that made the bees happy. 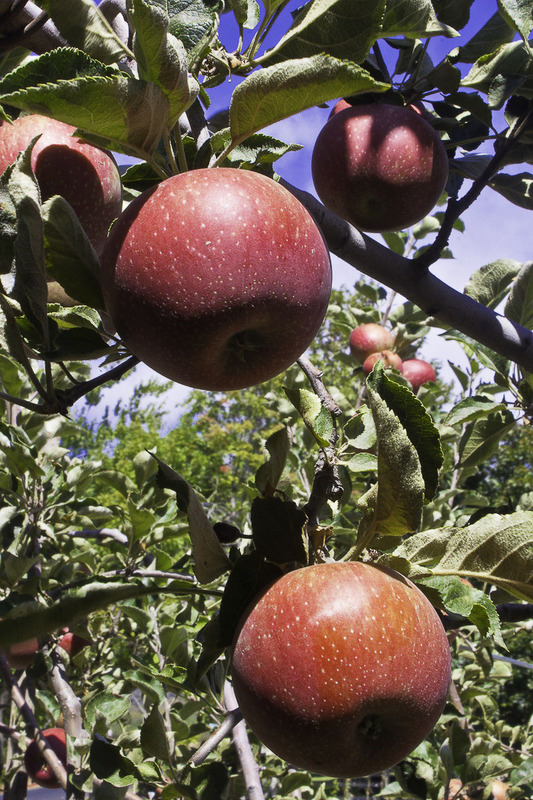 October means apples in Southern California. On Palomar Mountain in San Diego County, behind Castaic Lake in upper Los Angeles County, and Oak Glen in the mountains above Redlands and Yucaipa. As always, the crisp air and crisp apples made a day-trip totally worthwhile. November begins the big holidays of the year. 2016's November brings the ever-popular Día de los Muertos events, and this year, a spirit-killing election. 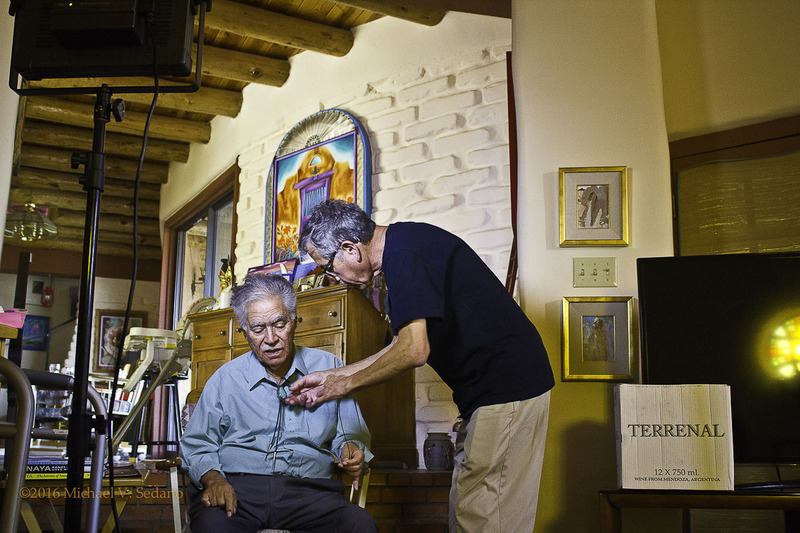 Pola Lopez and Angel Guerrero shared an altar of great beauty and political insight. The election for president devastated spirits across the land. As a countermeasure, a small group gathered at Casa Sedano for a no-politics Mental Cocido. Mostly, we followed the rule and spoke our dismay for a limited period. 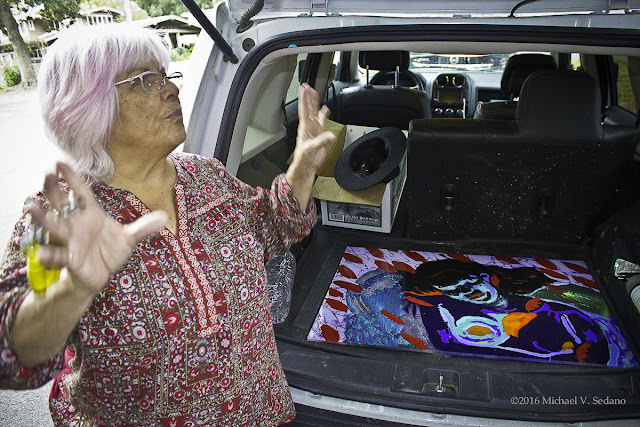 Margaret Garcia brought a fused-glass work-in-progress to share. García is collaborating with 3D software developer Mario Guerrero to develop ways to use new technology to address artistic design. November 2016 brought me the best garden surprise I've known. I inherited my mother's collection of Epiphyllums. One, a flat-penca specimen with green-yellow-red branches, had never bloomed. We thought it a non-bloomer. A couple years ago it formed a bud that swelled and curved and opened at night. By first light, the petals had collapsed and I could not make a photograph. A couple years later, I closely followed the budding and swelling process. When I estimated it would open I planned to go out before dawn to photograph it. When I went out, tripod and camera in hand, the blossom was done. Night-time only, it seemed to promise. Two years later another bud formed. This time I set up the equipment and at two in the morning stepped into the moonlight where, over two hours, I watched the flower open. I photographed it by porch light and flashlight. It's an ethereal beautiful portrait. I counted myself triumphant and fortunate to have the frames. In November, she bloomed mid-morning and remained fully formed most of the afternoon. I was stunned the entire time. 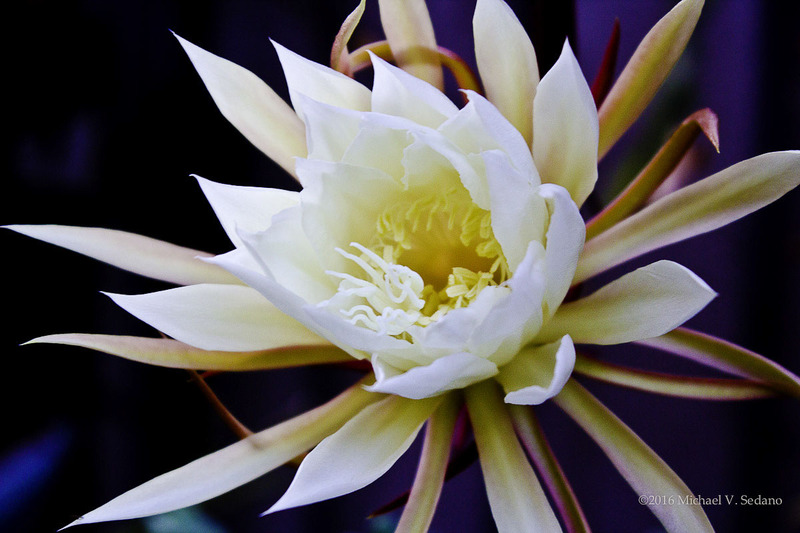 I've learned some call this "Queen of the Night" and although I'm not a monarchist, I understand the allure motivating naming this magnificent flower. 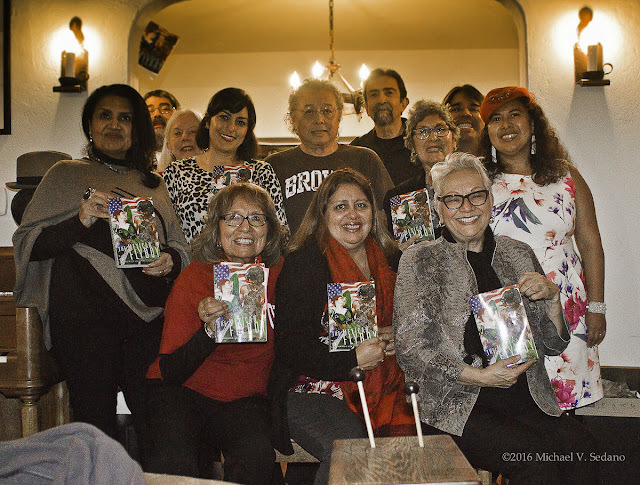 November 2016 closed with a visit of author Alfredo Véa and The Book Club of the Chicano/Latino Stanford Alumni Association of Southern California to Casa Sedano. Véa's The Mexican Flyboy is genuinely a must-read novel. Speculative literature readers will enjoy it for certain, and most readers will find its compelling plot and time-travel conundra make The Mexican Flyboy the best novel they've read in years. When December 2016 ends in a few days and people look with increasing dismay toward the approaching end of normalcy in the nation, it's appropriate to echo a question Kathleen Alcalá asks in her recent nonfiction work, The Deepest Roots: Finding Food and Community on a Pacific Northwest Island. Where will you get food locally if distribution systems go to hell? How about surviving for a long-term disruption? 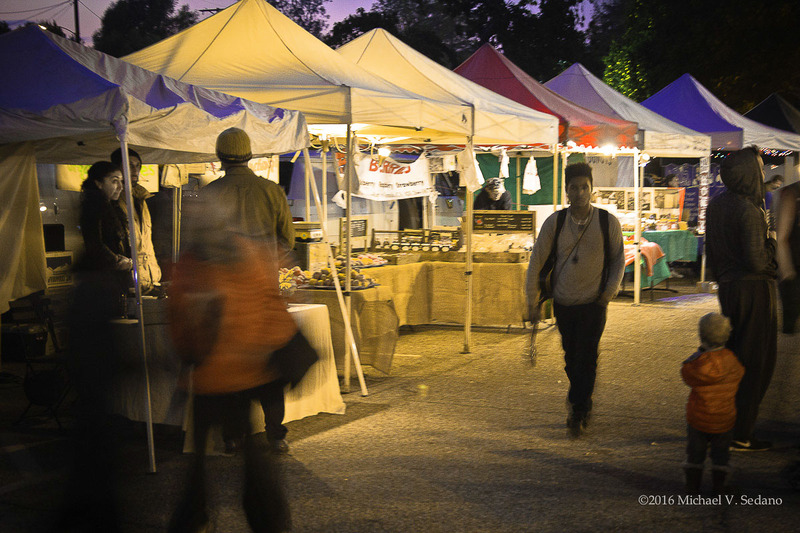 One important answer is the profusion of local farmers markets. I enjoy the Altadena Farmers Market where McDonald's Urban Farm sells multicolored eggs, fruit, and luffa gourds. Other vendors sell eggs, meat, gluten-free baked goods, honey, cheeses, fruits, nuts, vegetable plants, knife sharpening, and handicrafts. 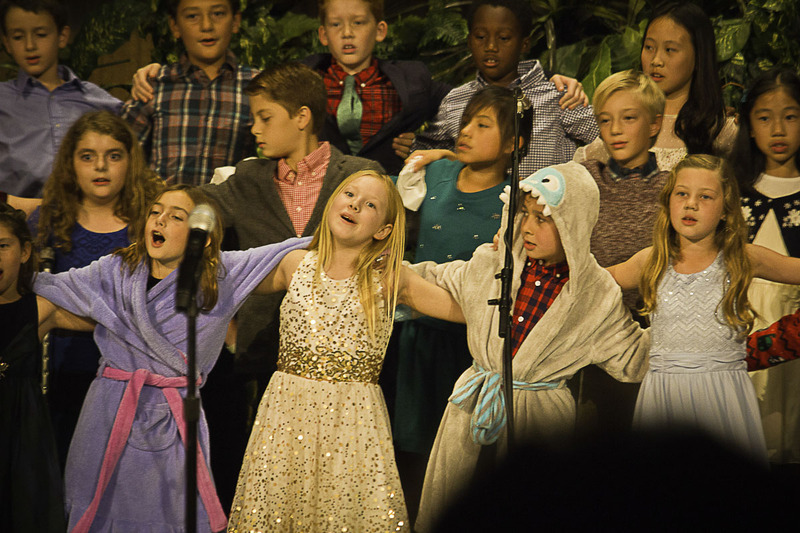 If anyone needs a reminder that joy is humanity's natural state, look to the holiday programs children's schools stage for grateful students, teachers, and families. Nothing, not the most magnificent symphony nor even whale song matches the sound of children's voices raised in the hopefulness of the holidays. Every year, month, season brings its own special joys and memories. 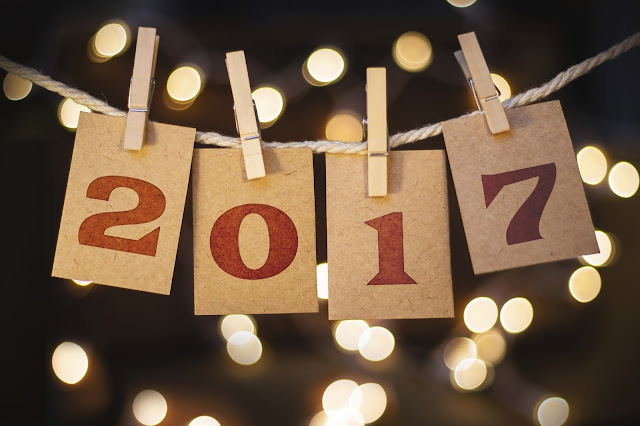 May 2017 fill your life with the greatest things you've ever seen, great art, wonderful flowers, and the continuous warmth of friends, familia, and community. 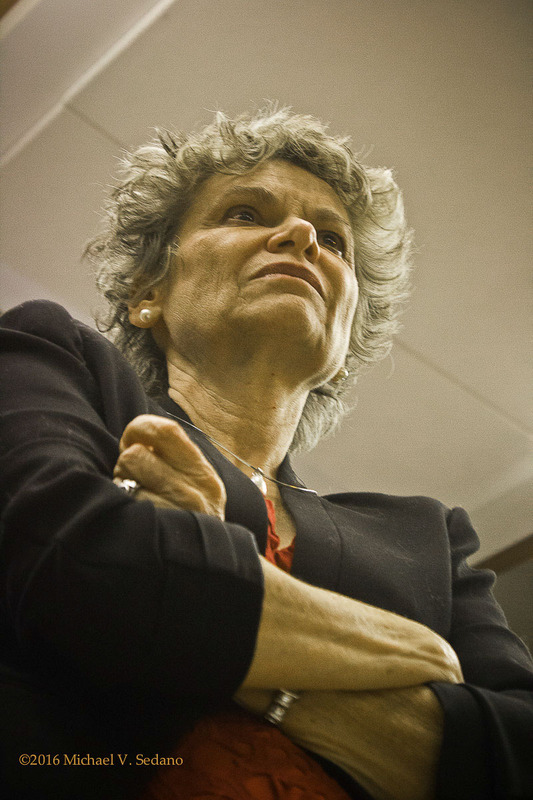 Juana Iris Goergen es originalmente de Puerto Rico. Dirige el Programa de español en la Universidad San Vicente DePaul en Chicago, donde además se desempeña como profesora de Literatura del Caribe y América Latina. Como poeta ha publicado La sal de las brujas (Finalista del premio Letras de oro, 1997), La piel a medias (2001), Las Ilusas/Dreamers (2008). Su poesía ha sido parcialmente traducida y publicada en alemán y en francés. Es iniciadora y co-organizadora del festival internacional de poesía, Poesía en abril –al presente en su décimo año- en la ciudad de Chicago. Xánath Caraza (XC): ¿Quién es Juanita Goergen? XC: ¿Quién o quiénes te introducen a la lectura? ¿Quién o quiénes guían tus primeras lecturas? JIG: A los pies de mi madre, mientras ella bordaba y hacía sus costuras, recibí mis primeros poemas. Ella guió mis primeras lecturas y luego los libros de filosofía y humanidades que traía de la universidad a la casa, mi hermana Bruny. XC: ¿Cómo comienza el quehacer literario para Juanita? JIG: Yo me aprendía los poemas de memoria y declamaba mucho en la primaria. Mi mamá también escribía poemas, así que nos animaba con la escritura. Las maestras me animaban mucho a escribir y a participar en concursos literarios desde pequeña. Siempre tuve la suerte de ganar algo y eso me animaba a seguir escribiendo. 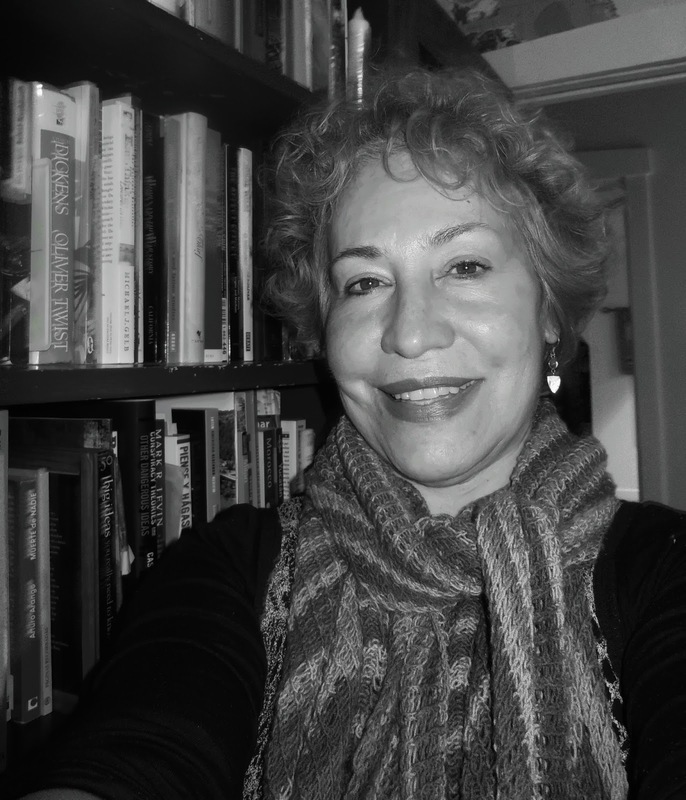 Cuando era estudiante universitaria en Puerto Rico, Eloísa Lezama Lima –hermana del poeta cubano José Lezama Lima- era mi profesora y me animó a participar en un concurso literario. Gané el primer premio y me publicaron el poema. Fue impactante por supuesto. Uno de los jurados fue el insigne poeta puertorriqueño Francisco Matos Paoli quien después de haberme escuchado leer el poema, vino a felicitarme y me dijo unas palabras que no olvidaré nunca: “No habites la Poesía, deja que la Poesía te habite, y verás como ella proveerá.” Yo guardo ese consejo muy profundo. XC: ¿Tienes poemas favoritos de otros autores? “Alto lo dejo en su épico universo//y casi no tocado por el verso.” Es para mí el encuentro con lo magistral, con el poder de la Poesía. Es un poema sobre la muerte del sujeto lírico donde éste es salvado por el verso, por la tradición de la poesía épica, y no muere. Es un texto poético que me inspira a revisar una y otra vez el final y el principio de mis poemas. 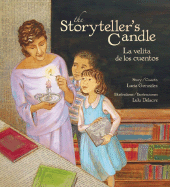 XC: ¿Cómo es un día de creación literaria para Juanita? JIG: Nunca tengo suficiente tiempo para escribir. Desde hace un tiempo, viendo que existía un hueco en el engranaje poético de Chicago con el resto del mundo hispánico, empecé a trabajar en el festival internacional de poesía –Poesía en abril- y me he dado cuenta que convertirme en facilitadora y hacedora cultural para abrir espacios de poesía, por un lado es fantástico pero por otro es más difícil producir obra propia con regularidad, en esas circunstancias. La verdad escribo constantemente –tengo una pequeña libretita que siempre va conmigo- o grabo –también llevo conmigo una grabadora portátil a todos lados- pero no soy nada disciplinada para escribir, aunque estos últimos dos años he tratado de empezar un nuevo proyecto cada vez que comienza el nuevo año para poder concretizar proyectos. Lo que sí sigo es un ritual de escritura: escribo un poema y lo guardo por tres días en una cajita. A los tres días lo saco y lo vuelvo a trabajar, lo dejo otros tres días, lo vuelvo a sacar, lo trabajo o lo descarto. Al séptimo día descanso -dice una amiga poeta que esa es la técnica vanguardista ‘del pequeño dios,’ que Huidobro estaría orgulloso- El problema es que soy muy perfeccionista y a veces descarto mucho. XC: ¿Cuándo sabes que un poema está listo para ser leído? JIG: Cuando el poema tiene el ritmo de los poemas de mi madre y la agudeza de las poetas que leo y releo –Pizarnik, Anne Sexton, Akhmatova, Sondergran- para nombrar algunas. XC: ¿Pudieras compartir tus actividades como poeta/ activista cultural? JIG: Inicié y estuve co-organizando hasta el año pasado el festival internacional de poesía: Poesía en abril, al presente en su noveno año. Organizo lecturas y actividades de poesía a lo largo del año en la universidad donde trabajo, y organizo actividades de poesía y ‘performance’ para mis estudiantes de Odisea, un programa comunitario del Humanities Council en Chicago. XC: ¿Cuál piensas que es tu papel como mujer y poeta? ¿Crees que hay alguna responsabilidad? JIG: Creo que la Poesía salva y sana. Pienso que todos los que se dedican al arte en cualquiera de sus formas, tienen una gran responsabilidad. Yo me hago eco de las palabras de Chantal Maillard, “Escribo para que el agua envenenada pueda beberse” y también de John Berger, en La hora de la poesía, cuando nos recuerda, que los poetas deben “escribir la herida.” Un poema en su conjunto de palabras puede provocar una hecatombe. Platón lo vio claramente, por eso fijó límites y dejó fuera a los poetas de su República. XC: ¿En qué proyecto/proyectos literarios estás trabajando ahora? JIG: Acabo de terminar Mar en los huesos y quiero empezar a ‘cuadrar’ Oda al sueño americano/Ode to the American Dream con el objeto de terminarlo el año que entra. XC: ¿Qué consejos tiene Juanita para otros poetas que comienzan? XC: ¿Hay algo más que quisieras compartir? JIG: En estos momentos de incertidumbre política y social en el mundo, es mi deseo y mi plegaria –Que se despierten los poetas del mundo hispánico y dejen oír la voz de su Poesía en las plazas, en los planteles y en las calles del mundo.¡Mil gracias por pensar en mí para esta entrevista, Xánath! Estoy muy agradecida. Posted by Xánath Caraza at 12:00 AM 0 comments. Click here to leave a comment. 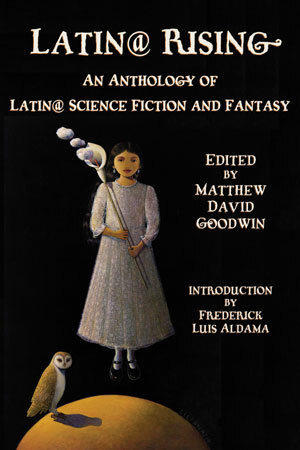 You can order it now, ahead of the official, February 1st 2017 release, Latin@Rising: An Anthology of Latin@ Science Fiction & Fantasy, edited by Matthew David Goodwin, a literary/cultural landmark for the brave new world featuring writers who are familiar to La Bloga readers Kathleen Acalá, Sabrina Vourvoulias, Junot Díaz, Daniel José Older, and many others. And there’s a story by me: “Flying Under the Texas Radar with Paco and Los Freetails,” a prequel to my Paco Cohen, Mariachi of Mars series that so far consists of “The Rise and Fall of Paco Cohen and the Mariachis of Mars” (Analog, April 2001) and “Death and Dancing in New Las Vegas” (Analog, April 2011). Lucky for me, and not without irony, “Flying Under the Texas Radar with Paco and Los Freetails” has become relevant again. When I originally wrote it, I was making fun of the political situation a few years ago. When it didn’t sell right away, I was afraid that it would become dated. Guess I’ve got to realize that when writing about the Latinoid condition, political turmoil is normal, and it never goes out of style. There’s a song by Bruce Cockburn,“The Trouble with Normal.” And the trouble is that it always gets worse. I do wonder why Trump is so interested in going to Mars? Will his deportation force be part of the space program? Somehow, I’m just twisted enough not to let it get me down. I have this vision of people like Paco Cohen, surviving in hostile environments, creating fantastic new cultures, reinventing themselves when an oppressive society smashes them. Aztlán standing in for Mars. ¡Que Chicano! Talk about the Latonoid condition . . . 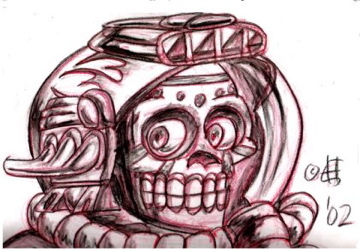 So now l’m working on another story, “Chasing Mermaid Songs Beyond the Yeti Highway” in which Paco -- who now goes by Teo – and his wife and daughter take off for the Martian outback, and find . . .
Maybe I shouldn’t reveal that yet. What I need to do is keep writing. This vision won’t leave me alone. And I promised Ben Bova that I’d continue with these stories until they become a book like Ray Bradbury’s The Martian Chronicles -- a Great Martian Novel. I even have a title, Paco Cohen is Alive and Well and Living on Mars. Ernest Hogan is not a mariachi, and has never been to Mars, but he still wrote HighAztech, Cortez on Jupiter, and SmokingMirror Blues. coloco figuras de barro en mi nacimiento. rodeados de mil pastores llenos de agradecimiento. que buscan un buen lugar para llenarlo de alegría. fuegos artificiales, canciones y diversiones. Farm to Fork. Holiday Sales.